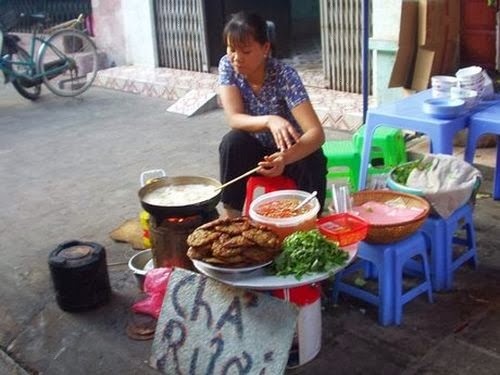 Hanoi people are famous for the simple but subtle cuisine. As time goes by, the capital’s food is more and more affirmed its important position in Vietnamese culinary culture. Besides the variety, the cuisine of Hanoi still keeps its traditional feature. The following introduce 10 simple and delicious dishes of Hanoi which are existed for a long time. 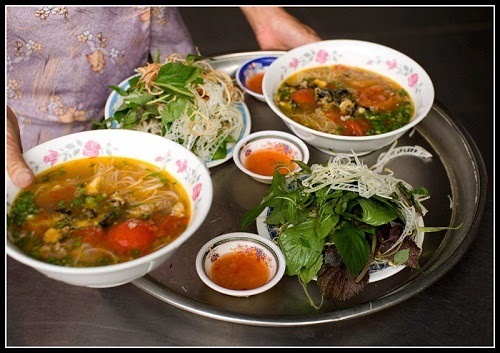 First thing to remember when talking about Hanoi is “Pho” or noodle soup. 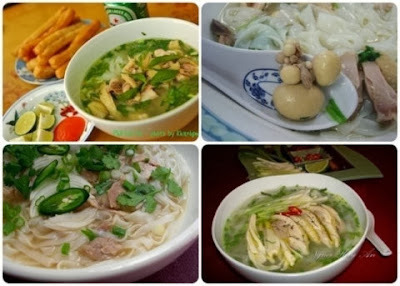 “Pho is a special gift ofHanoi, not just only in Hanoi, but because only in Hanoi that it is delicious”, Thach Lam wrote. “Bun cha” (vermicelli with grilled meat) is known as a particular gift which Hanoi sent to all over the country. It is the delicious of the well-grilled meats and the sweet-and-sour sauce that grab every guest’s footstep. Bun cha in Dong Xuan market lane, 14 Hang Than st, 81alley Lac Long Quan st or pavement at the intersection of Nguyen Du and Ba Trieu st… is some good address for this dish. 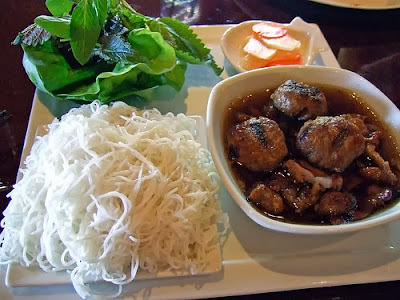 With nearly 20 ingredients, “bun thang” (vermicelli in chicken soup) is the dish that the cooking method requires the scrupulousness, care and sophistication of the cook, and also is one of the typical dishes containing innumerable quintessence of Hanoi’s culinary. “Cha ca La Vong” (La Vong fried fish dish) is the perfect combination of typical Vietnam’s spices such as: saffron, fennel, shrimp paste and fish sauce. All of those mix together into a unique, incredibly delicious and attractive dish. Cha ca La Vong is always in the list of foods that can’t be ignored by foreign visitors once coming to Hanoi. The famous restaurant is located at 14 Cha Ca st.
“Banh cuon Thanh Tri” (rice rolls) is a traditional dish which is made of rice-flour. It has the very thin and light roll covered by a yellow fried-onions layers, dipped in the tasty sauce with some roasted cinnamon porks (“cha que”). 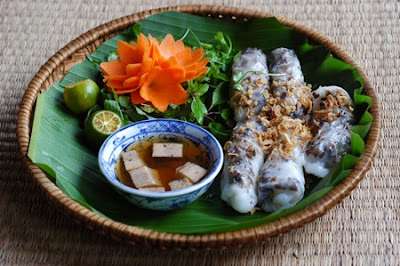 Nowadays, you can eat “banh cuon” in everywhere, but those made in Hanoi, especially “banh cuon Thanh Tri”, still have their specific characteristics. 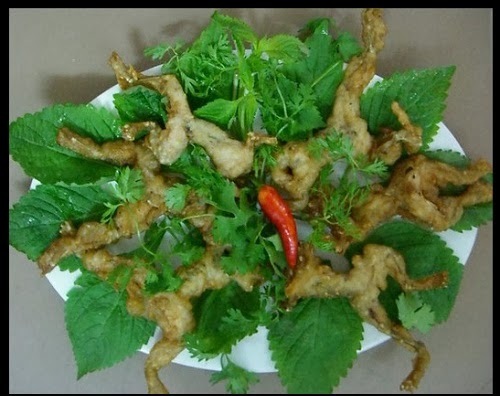 “Cha ruoi” is a scarce speciality of Hanoi, because the nereididae sandworm only can be found in a short season. 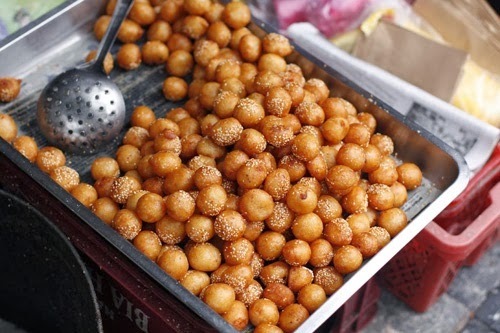 “Cha ruoi” which is crispy outside, soft inside, greasy and the delicious smell pervades all the guests is often sold at O Quan Chuong, in Lo Duc st and Gia Ngu st.
“Banh ran” (fried cake) is a popular cake in Hanoi, but “banh ran luc lac” or shaken fried cake is a traditional dish of Hanoi’s people. Its outer shell is made from glutinous rice flour, covered with roasted sesame. Especially, the filling made from sweetened mung bean paste is separated from the shell so that when you shake the ball cake, you can feel the rattled of it inside the shell. You can buy “banh ran luc lac” at 21 Le Dai Hanh st or 16A Ly Nam De st. 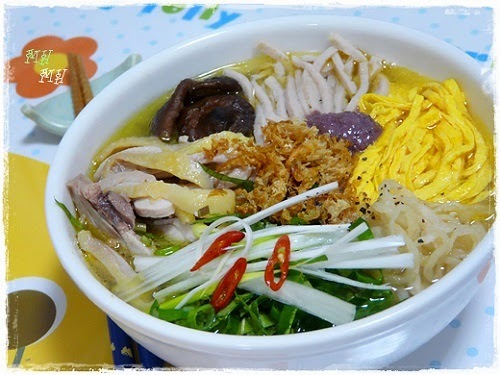 Cold snail noodle (Cold snail noodle) is particular dish of Hanoi. It’s not easy to find the place where served this dish and not so many people can cook it well. Its consommé is a little sweet, fresh, sour and salty enough with the fragrant of ginger, the pungent of chili. You can find it at 202F Doi Can st or at O Quan Chuong. With Hanoi’s gourmets, “cha nhai” is a special food of Hanoi alone. The frog is chopped both meat and bones, crushed well, mixed with spices, chili, citronella, lime leaves… and deep fried in boiling oil pan. Then, we have a fragrant food that is a favorite dish of many people. The most delicious “cha nhai” is sold at Khuong Thuong st. When the autumn wind comes is also the time that “Com” (grilled green rice) is appeared in many streets in Hanoi. 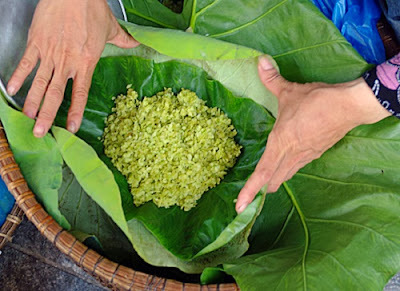 “Com” is made from green sticky rice that is harvested in blossom period, roasted in many times, crashed and sieved. When eating com, you must eat slowly and chew very deliberately in order to appreciate all the scents, tastes, and plasticity of the young rice. Com is used in many specialities ofVietnam, including com xao (browned com), banh com (com cakes), che com (sweetened com soups), etc. You can find “com” everywhere in Hanoi, but the most delicious “com” is processed in Vong Village, where com making has been a professional skill for many generations. 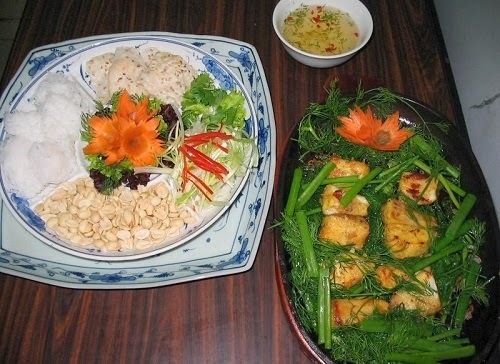 There are many tasty dishes you should enjoy when visiting Hanoi. Come here, and feel the soul of Hanoi’ cuisine!